A small, rural school district in western Kentucky along the Ohio River, Union County School District focuses on education at the core of its mission and communications. The district, which serves primarily farming and coal mining families, consists of one high school, one middle school, three elementary schools and one large private K-8 school. 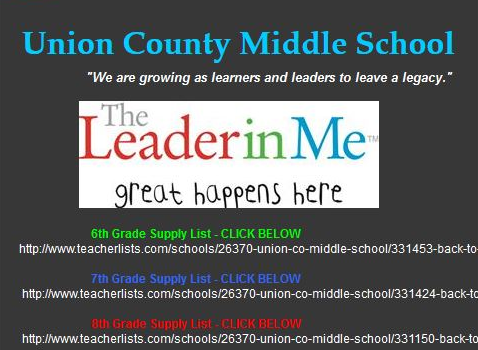 At Union County Middle School, parents and students want to get their hands on classroom supply lists as soon as they are available. With the increasing community migration to online and social media, the district saw an opportunity to streamline school supply lists by providing them to families and retail stores in a web-based, digital format. 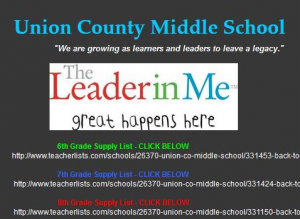 Brooke White, guidance counselor at Union County Middle School, heard from a neighboring district educator about TeacherLists, an online supply list data management service, and decided to find out more. In her first year at the middle school, White hadn’t met every member of the staff or gained full access to administrative resources yet. She worked closely with the assistant principal to implement TeacherLists, and instructed all staff to forward their school supply lists so she could enter them into TeacherLists. While in the middle of shopping for school supplies, one parent asked on the school district’s Facebook page where she could find the seventh grade supply list. White simply replied with the link to TeacherLists.com. The parent received an immediate response, and didn’t have to visit the school or wait for a copy to arrive in the mail. She simply continued shopping with the list displayed on her mobile device. TeacherLists is the smarter way to manage, find and share school supply lists for teachers and parents, free-of-charge. After uploading a school supply list once, educators can easily update and link the list to a school or personal website. TeacherLists provides parents the freedom of accessing and finding the most updated school supply list, twenty four-seven. For more information about TeacherLists, visit www.teacherlists.com.